In signs of rising income inequality, India’s richest one per cent now hold a huge 58 per cent of the country’s total wealth — higher than the global figure of about 50 per cent, a new study showed on Monday. The study, released by rights group Oxfam ahead of the World Economic Forum(WEF) annual meeting here attended by rich and powerful from across the world, showed that just 57 billionaires in India now have same wealth ($ 216 billion) as that of the bottom 70 per cent population of the country. 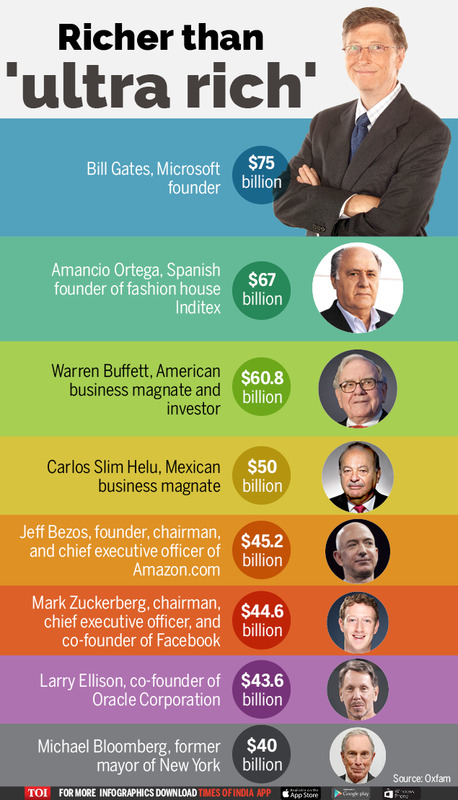 Globally, just 8 billionaires have the same amount of wealth as the poorest 50 per cent of the world population+ . 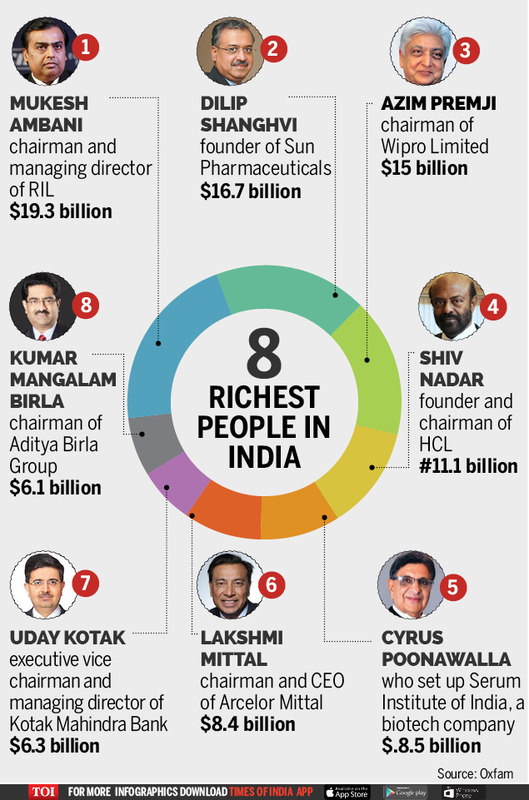 The study said there are 84 billionaires in India, with a collective wealth of $248 billion, led by Mukesh Ambani ($9.3 billion), Dilip Shanghvi ($16.7 billion) and Azim Premji ($15 billion). 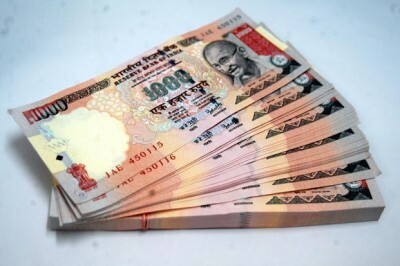 The total Indian wealth in the country stood at $3.1 trillion. In the report titled ‘An economy for the 99 per cent’, Oxfam said it is time to build a human economy that benefits everyone, not just the privileged few. It said that since 2015, the richest 1 per cent has owned more wealth than the rest of the planet+ . « Over the next 20 years, 500 people will hand over $2.1 trillion to their heirs — a sum larger than the GDP of India, a country of 1.3 billion people, » Oxfam said. The study findings showed that the poorest half of the world has less wealth than had been previously thought while over the last two decades, the richest 10 per cent of the population in China, Indonesia, Laos, India, Bangladesh and Sri Lanka have seen their share of income increase by more than 15 per cent. On the other hand, the poorest 10 per cent have seen their share of income fall by more than 15 per cent. « Due to a combination of discrimination and working in low-pay sectors, women’s wages across Asia are between 70-90 per cent of men’s, » it said. Referring to the Global Wage Report 2016-17 of the International Labour Organisation (ILO)+ , the study said India suffers from huge gender pay gap and has among the worst levels of gender wage disparity — men earning more than women in similar jobs — with the gap exceeding 30 per cent. In India, women form 60 per cent of the lowest paid wage labour, but only 15 per cent of the highest wage-earners. It means that in India women are not only poorly represented in the top bracket of wage-earners, but also experience wide gender pay gap+ at the bottom. It also said that more than 40 per cent of the 400 million women who live in rural India are involved in agriculture and related activities. However, as women are not recognised as farmers and do not own land, they have limited access to government schemes and credit, restricting their agricultural productivity. The study also said that the CEO of India’s top information technology firm earns 416 times the salary of a typical employee in his company. In the US, by contrast, billionaires have frequently chosen to cash out of their businesses, and their wealth has not lasted so long. In Asia, Singapore and India have a high number of multi-generational billionaires and a lot many people across the globe, including India, will transfer wealth to their heirs in the next 20 years, the study said, while pushing for a need to establish a system of inheritance tax. It also referred to the world’s largest garment companies that have all been linked to cotton-spinning mills in India, which routinely use the forced labour of girls. « There are evidences against cotton-spinning mills of India, which feed into the world’s largest garment companies, using forced labour. As per ILO, there are 5.8 million child labourers in India, » it added. In the UK, 10 per cent of profits were returned to shareholders in 1970 and this figure is now 70 per cent. « In India, the figure is lower, but is growing rapidly, and for many corporations, it is now higher than 50 per cent. In India, as profits have been rising for the 100 largest listed corporations, the share of net profits going to dividends has also increased steadily over the last decade, reaching 34 per cent in 2014/15, with around 12 private corporations paying more than 50 per cent of their profits as dividends, » it said. « South-East Asia and India have both substantial coal power development plants and large populations without access to electricity. While coal provides 75 per cent of the nation’s electricity, many areas with the densest concentration of coal plants also have the lowest rates of electricity access, » it said. « Indian government must eliminate tax exemptions and not further reduce corporate tax rates. Governments must support companies that benefit their workers and society rather than just their shareholders, » Oxfam said. « Indian government must crack down on tax dodging by corporates and rich individuals to end the era of tax havens. Government must generate funds needed to invest in healthcare and education. The government must increase its public expenditure on health from 1 per cent GDP to 3 per cent of GDP and on education from 3 per cent of GDP to 6 per cent, » it added.